The Kitshickers are something of a local institution : since more than five years they are releasing album after album, and still in the same line-up as in the very beginning. Armée de l'Air is their third regular album, and again they present a bag full of songs, separated in two categories. The first eight songs come under the title From The Known, as these are songs you could hear already on their gigs months before the album was released. The remaining seven songs, To The Unknown, show the newer stuff. With most bands, this separation wouldn't make much of a difference, but the Kitshickers show that they have evolved over the past few years. Where the first part of the album clocks in just under half an hour, the second part – with one song less – takes up the remaining three quarters of an hour. This means that the older songs are shorter and straighter: most should know Tic Toc and No already from the Tales Of The Winged Skull compilation, but also Never Again has been frequently heard in the past. Highlights are the contemplative instrumental piece Summer Rage Song and the politically charged and condensed Project Codename W. The second part of the CD begins with Roquefort, where Gilles shares the vocals with Gilli... as much as I like the latter's band Torpid, I think that this is one of the weaker songs. From there on, you will be treated with some really long material, like the 7plus minutes songs Deathmatch and It's Way To Hell In Here, the latter being an instrumental stoner blues song that works astonishingly well. The end of the albums comes with a nearly 13 minutes epic called Tonight When You Fight, I'll Start To Cry. So once you're through, you will probably exhale after these 75 minutes of unrelenting noise rock. 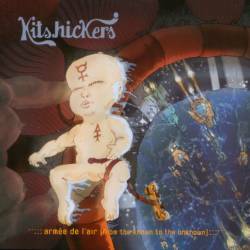 The Kitshickers underline how important it is to put a lot of music on a CD, but you might get the impression here as if Armée de l'Air may be a little over-ambitious. With 3 or 4 songs less, it would have made the listening easier, but then I suggest you either only listen to the beginning (if you're in a rock'n'roll mood) or to the end (if you want to space off). It's a good album, though, and they are shedding off the amateurishness of their debut, and finetuning the songwriting which couldn't always convince in the past. The main problem is still Gilles' voice which sounds best when it's used sparsely, like on the Unknown part of the album.